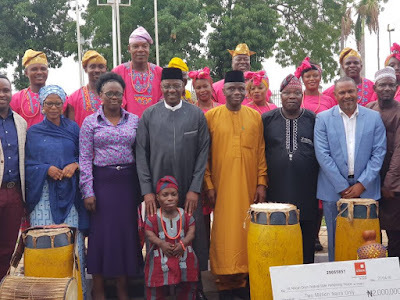 Kwara State Art Council Troupe has emerged the victorious at the just concluded third edition of African Drum Festival held in Abeokuta, the Ogun State capital. Which Imo State came second position came while the host, Ogun State emerged third in the continental fiesta attended by twenty-two states troupes and seventy-three private troupes. While receiving the victorious troupe of Kwara State Art Council at the Government House, Ilorin, Governor Abdulfatah Ahmed congratulated the members for making the state proud. Governor Ahmed commended the state Art Council for positively projecting the image of the state and its people. The elated Governor promised further support to the troupe to enable it excel at national and international competitions.